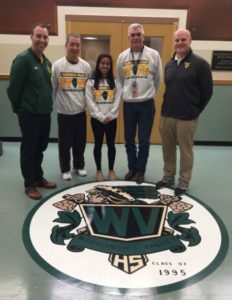 CHARLESTON – She’s had more experience at IHSA State than most athletes, and she’s only in her third year at Waubonsie Valley. 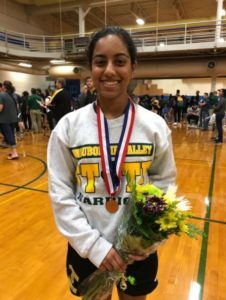 Shalu Manoharan returned to the IHSA State badminton finals this weekend and repeated her sixth place finish in singles from one year ago. Manoharan was one of the top seeds entering the tournament at Eastern Illinois University, and it showed in her first three matches, winning all of them in straight sets. In the first round, she defeated Glenbard North’s Savannah Cornejo-Garcia, 21-5, 21-6. The next round, she took care of Hinsdale South’s Simin Rajwany in similar fashion, 21-4, 21-6. In the third round, she defeated Wheaton-Warrenville South’s Julianna Rylko, 21-19, 21-17. It wasn’t until the quarterfinal round that Manoharan finally ran into trouble in the form of eventual state champion Esther Shi from Stevenson, losing 21-7, 21-8. From there, Manoharan picked up the pace in the consolation bracket, winning two more, before reaching the fifth place match, where she lost to Neuqua Valley’s Lauren Ho, 21-18, 21-19. It’s the third time in three years that Manoharan has placed in the Top 10 at IHSA State. She finished 5th in both 2015 and 2016. She is fourth player in Waubonsie badminton history to qualify for state and the third to reach state three times, behind Rebecca Hsu and Joyce Tsai (’04-’06). Previous Previous post: LipDubV 2.017 is Live!